The program will consist of presentations by individuals vested in Metastatic Breast Cancer research and treatment. After the presentations, young researchers will provide brief overviews of their breast cancer research projects. 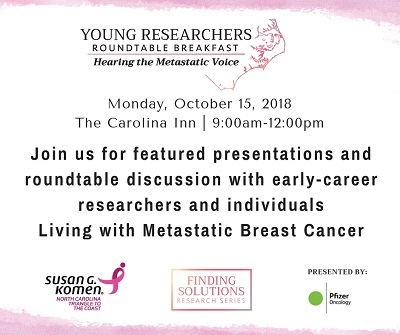 Following the researcher overviews, there will be table discussions about breast cancer research and treatment and its impact on patient care with a focus on the care of those Living with Metastatic Breast Cancer.